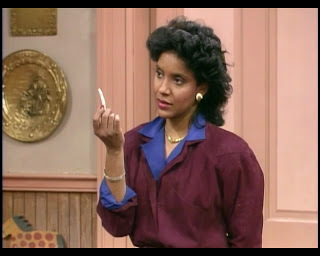 Phylicia Rashad holding a joint. No, not that top; she already had that. What fell out of Theo's book was a joint. But back to the blouse: she wore it better in episode 8, when this strange outer husk hadn't yet formed over it. Really, though, help me out with this top garment. It seems to defy classification, somehow merging the worst features of the house dress, the trench coat, and the artist's smock. Look at it. Come on, Clair. You've smoked pot. Like when you bought this dress thing. Let's start by acknowledging that it doesn't match the shirt beneath it. Those two colors are truly, deeply offensive together. Of course, that heapin' helpin' of puce is kind of offensive all by itself. Mostly, it just seems like she's inexplicably wearing a bathrobe made of ultrasuede synthetic upholstery. This is, without question, Clair's wrongest look yet, and that includes last week's yellow number. Since I hate to hate on her, however, I have to offer tentative praise for those boots. We barely see them, but they seem pretty hot. The proportions here are a little off: I don't like that the boot ends right where the skirt does, and I think both sides of that equation end up at an awkward length. And not to sound like a broken record, but come on, you really came into the house in the dead of winter wearing high-heeled boots with black soles and didn't even consider leaving your footwear by the front door? Your hardwood floor will be covered with dents, scuffs, and puddles. I know you're wealthy, but are you planning to just run this house into the ground and then buy a fresh one later? Speaking of later, what else did Clair wear this week? Her face is the stankiest. Her love for this shade is absolutely unending. No one's disputing how wonderful she looks in deep purples. I'm just saying that she's had plenty of success with pinks and reds, and I'm tired of not having a richer palette on which to comment. The tailoring of these sleeves is kind of fun and weird. The bunchiness and extra fabric around the biceps combine with the form-fitting torso to give the vaguest hint of Elizabethan inspiration. It's almost enough to make the shoulder pads work, though it doesn't help that we can see their outlines through the thin material. While I would be ready to accept the top on its own, we have the pants to consider. Rich people have the best cookware. I want those pots. If you can't believe your eyes, well neither can I. Matching slacks. It is, for all intents and purposes, a business casual sweatsuit. Clair, consider this your indigo intervention. Enough is enough. Since Cliff is standing right there, let's talk about him next. I have trouble with transitions sometimes, so it's nice when one is readily available. This is his last outfit, but you're comfortable working backwards with me, I'm sure. We've done it before. Anyhow, back to the magic: I'm disappointed that he's covered with that apron the whole time, because it looks as though there's some fun detailing happening across this sweater. As you might remember from episode 10, this isn't my favorite shade on him. But I think there's something to be said for the contrasting argyle-ish midsection. It would be nice to have a full view to critique, but I am denied such an option. I can, however, look more closely at his collar. Yeah, I like this less closer up. I'm trying to figure out if the sweater itself is pilly, or if those are just compression artifacts from the video stream. Either way, this is the wrong choice for him. I'm especially put off by the yellow and pink stripes around his neck. And I see that hint of maroon popping out from underneath. That doesn't go. Poor choice. Let's step back and take a look at just the red shirt, though. Their living room is so cream-colored. On its own, I don't hate the shirt. A long-sleeved polo isn't hugely fashionable, but the bricky hue is killer, and I'm impressed by how the rolled sleeves manage to freshen this look. I wish he'd unbutton that top button to look a little less like a Puritan, but this one could have gone so much worse. As for the pants, they're passable with the exception of what appears to be a purse-sized cargo pocket across the front. When Rudy was a baby, she probably fit in that pouch. But it wasn't a good idea then, and it's not a good idea now. Still, the bluish-gray trouser is a fun pairing with the top, so I'm satisfied with this. Caption-proof. 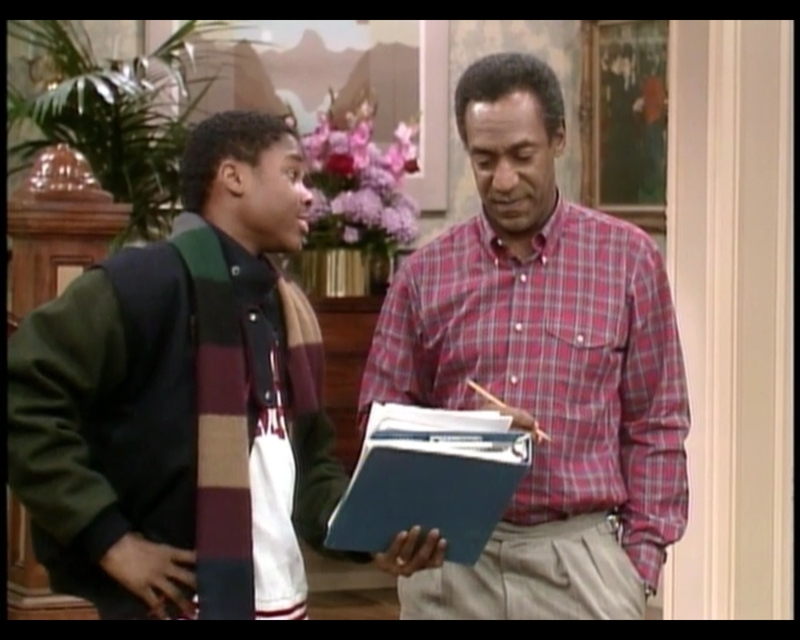 Well played, Dr. Huxtable. 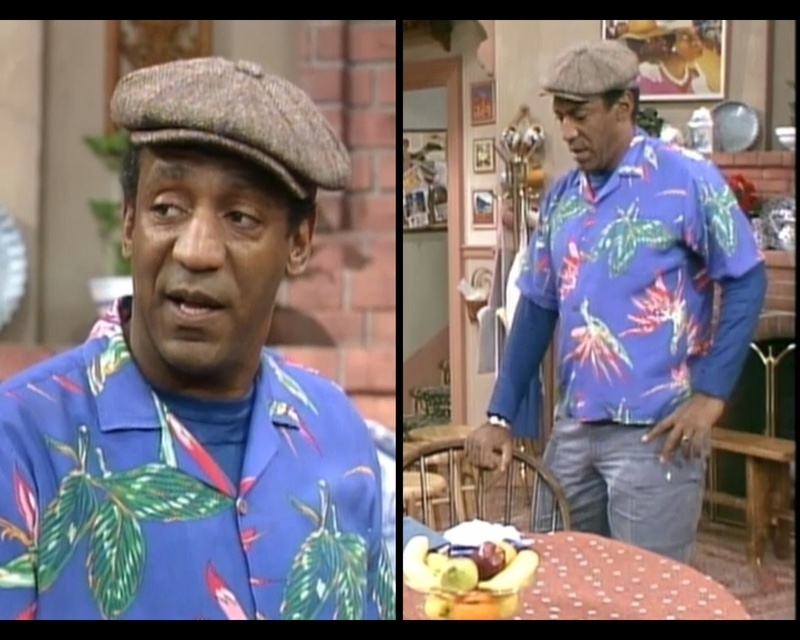 It looks like someone in the costume department forgot that this Hawaiian shirt was used in episode 12 as a joke, because it's worn here for real. Unfortunately, it reads like a punchline even when it's not supposed to. Maybe it's an ironic comment on the wintery weather, or an on-set prank referencing their competition with Magnum P. I. for ratings. Whatever the purported reason, it's still a big, loud, ugly shirt, and my conscience won't let me say a word of good about it. The long-sleeved tee beneath the short sleeves is very 90s; while I want to commend him for being a decade ahead of his time, I can't help but cringe at a style that now feels 15 years old. These are the same pants as in the earlier shot. That's fair: I wear pants two days in a row all the time. (Don't you judge me.) Oh, right, I almost overlooked that hat. It's like his head is having a different kind of day than the rest of his body. It's not that I disagree with the accessory, it's that I can't imagine why he would pair it with the rest of these items. After all the awesomeness he's worn this season, it's implausible to me that right now was when he decided that the hat would work. Now, we saw Theo earlier too, so let's spend a little time with him. I know that these are two different outfits, but for the purposes of this blog, they're essentially the same: sweatsuits. In fact, if you look closely, you can see that two of the three layers from the left side are repeated on the right: the hoodie is moved under the gray sweatshirt, but they're both still there. The point of these two configurations isn't fashion, though, so I can't really snipe. He's going to play some "Freeze Football" with his friends. The costume department didn't dress him to please me: they dressed him for winter sports. That said, I can't be forced to talk about sweatsuits, even if this show continues to throw them at me. 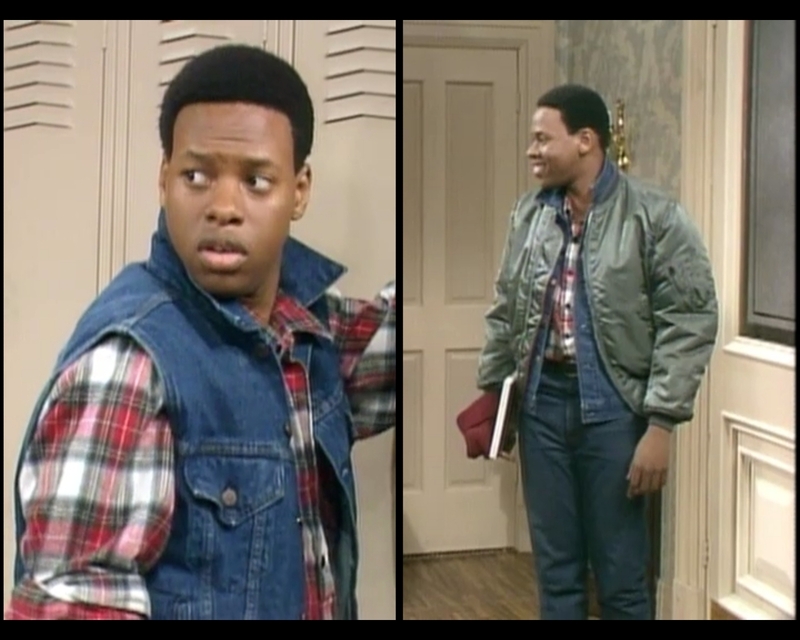 I'm a grown man, I can pick and choose which sitcom fashions to critique on the internet! ohgodmylifeisempty. "My shirt has a built-in vest! It's apparently a good thing!" I was looking forward to saying something meaningful about Theo this episode, but he already wore this shirt in episode 12, and you know he's wearing those same jeans again, so there's really not much work for me to do here. The clearer image of the top in question does give me, well, more questions. I'm not sure if I like it more or less. It's pretty odd. Also, there are at least two gold chains with dangly medallions around his neck. Why might that be? How can we prevent this from happening in the future? Why, by shaming him! Don't do this, people. 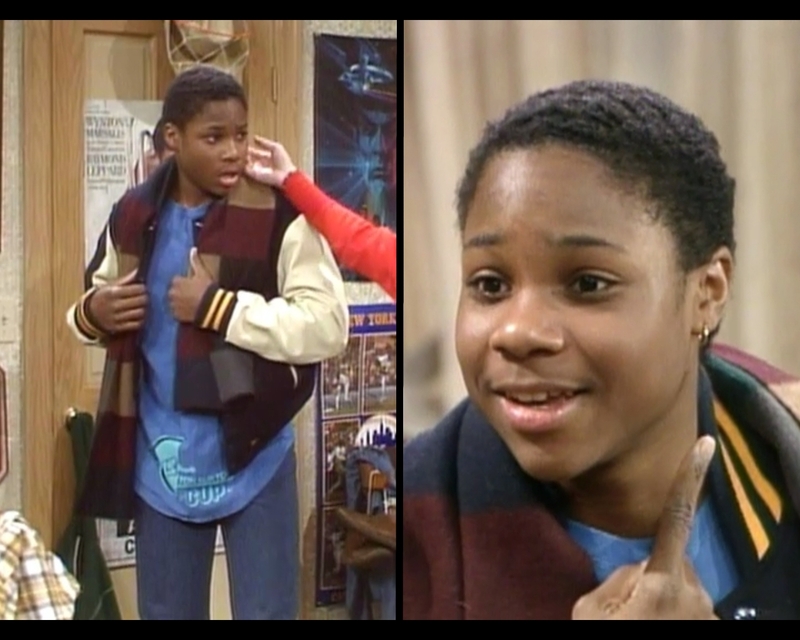 Don't be like Theo Huxtable. Together, we can stop this madness. Of course, if you're reading this, then I have to assume that you're not a man with three necklaces, and that you would already openly mock such a person. Good job, readers. See, Tempestt Bledsoe, I told you I started liking you later. 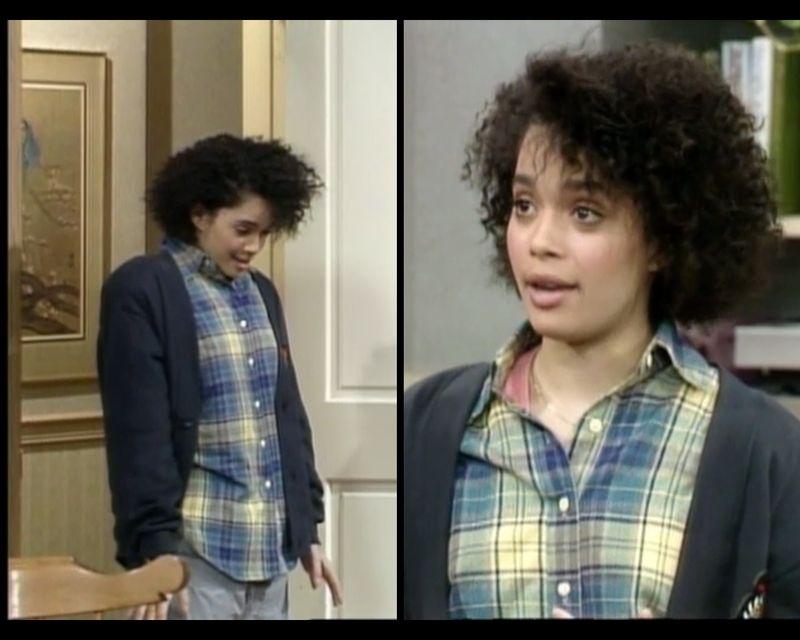 Before we get to Vanessa's styling, I want to pause and point out that this is one of those episodes in which the writers understand how to shape her character. There's a difference between being annoying and being humorously annoying, and her lines throughout really highlight that tightrope act. As she pushes harder and harder to figure out just what's going on in the house, and as everyone tries harder and harder not to let her know, the script takes every opportunity to milk the comedy out of that frustration. I wish there were more times when I enjoyed her this much. 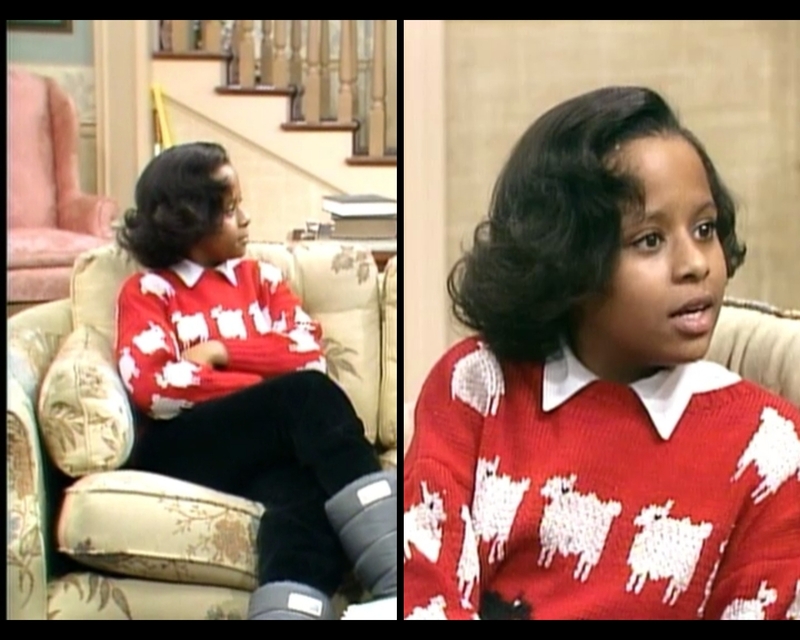 As for the sweater: seen it, episode 10. It even had the same pink turtleneck underneath. These pants are neither better nor worse than the jeans she wore it with last time. Next. Enormous winter boots in the house? Now you're just mocking me openly. And the hits just keep coming! Sure, black pants, white collared shirt, yeah yeah yeah. This sweater, by contrast, is secret genius. First off, it's a great color and a fun pattern. Plus, there's the small irony of the wool having been made back into sheep. But the clincher, which I had a hard time capturing in frame, is visible at the bottom of the right-hand close-up: a black sheep. This is just terrific in general, because I love the playful little visual pun. But it's especially good, if slightly mean, to put this sweater on Vanessa, and especially in this episode. It's so layered. On the one hand, the family is dealing with the drama of a teenager bringing drugs into the house. On the other hand, Vanessa ends up being the child most likely to break the rules, and if we have to pick a black sheep of the family, it's probably her. So this outfit doesn't just earn praise because it's fun, but because it's meaningful. This is exemplary costume design. for throwing on the floor as props. There is no overlap. Denise invented big hair being full of secrets. 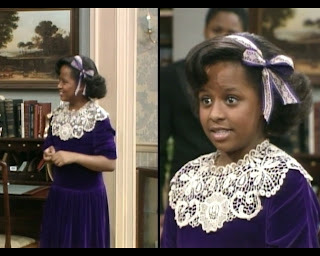 Again, I'm not sure where she got the idea to pull a classic Little Richard bouffant, but I'm not going to question it. You know how they say that the best way to steal something is to just walk right up and take it like you're supposed to? Same principle here. If you're sure, no one else will question it. Denise is so sure she could raise her hand. 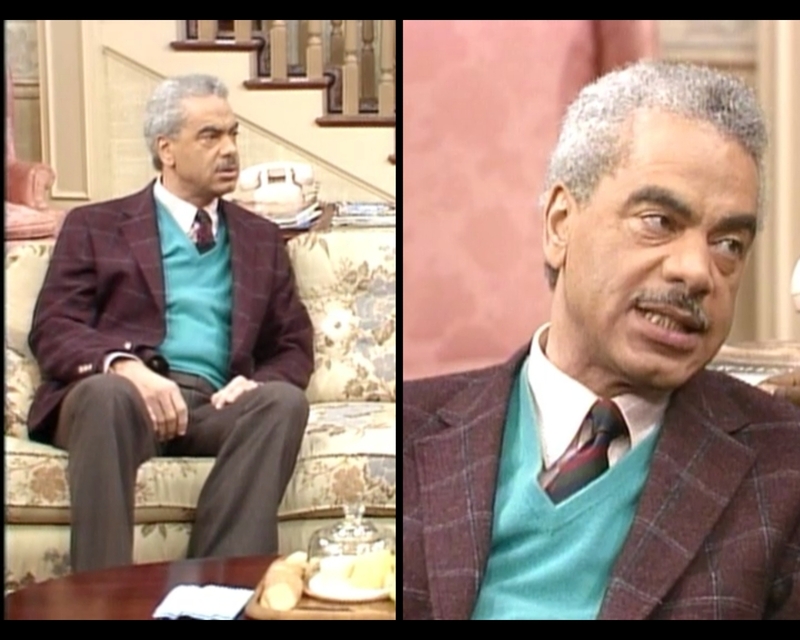 Hey Rudy, did you wear a hundred layers of sweaters in this episode just to troll me? Before we close up shop on this one, I've got a couple guest stars to get through. First, there's the kid who slipped the joint into Theo's book. You didn't really think it was Theo's pot, did you? Come on. Like he didn't have enough money for coke. You're making me HIGH! Baby, baby, baby, baby"
This is Stephen Thompson, playing Anthony Braxton. No, really. As in Tony. Braxton. He's named that. You're looking at his only acting role ever. It's a tough business. Anyhow, Anthony is supposed to be tough, and tough people don't think about outfits. His clothes read like a bad lesbian stereotype pretty much across the board: the dumpy jeans, the denim vest, the red plaid flannel. He should be walking into his office at a non-profit with a soy chai in one hand and his dog in the other. The tucked-in shirt is really what murders this one; I feel like a bad kid should at least be comfortable, you know? The obsessive-compulsive side of me (the same side that forces me to do this blog) is itching to write a whole new set of lyrics to "Un-Break My Heart" called "Untuck My Shirt." I know you're hearing it in your head now, don't lie. And now, from one female icon to another. She's smiling because she knows she's better than this. Ladies and gentlemen, Iman. On the off chance that you're unfamiliar (and I find it unacceptable that you would be, but whatever), she is a supermodel and entrepreneur originally from Somalia. Since moving away from runway and print work, she has started a cosmetics line tailored to darker skin tones and hosted Project Runway: Canada. She is married to David Bowie. As a woman who is comfortable in Yves Saint Laurent couture, I'm surprised she didn't combust at the mere thought of wearing this acrylic nightmare. I realize that they were trying to make her look less like a serpent goddess and more like a regular lady, but this is sick. I can barely pull my eyes away from that gory hairdo long enough to even comment on the rest of this, and truthfully I'm unwilling to put up a screencap that contains the whole outfit for fear that it will violate Blogspot's terms of service agreement for obscene imagery. Suffice it to say that this is a thousand percent uglier than it should be, and the baby bump they give her is so big that I have to assume she's giving birth to the world's most glamorous hippopotamus. 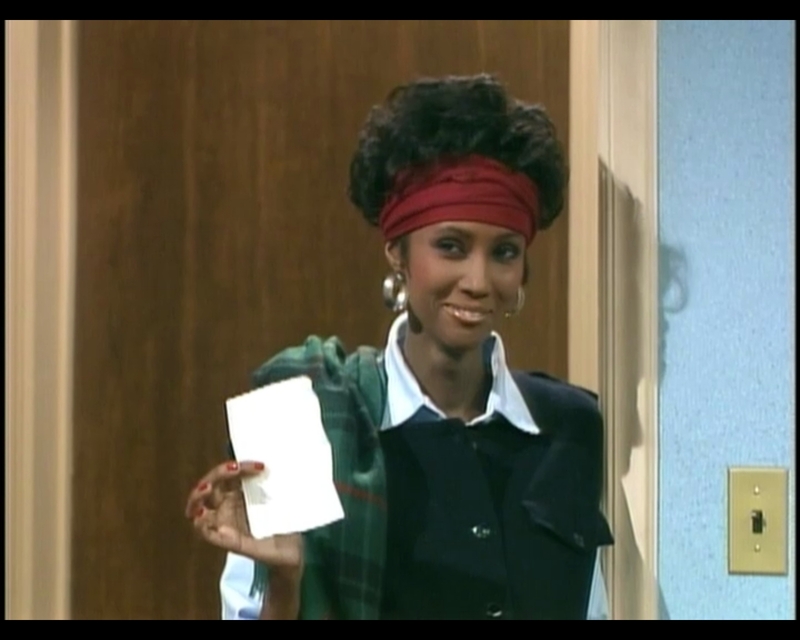 I advise you to go check out some of Iman's modeling work on YouTube, allowing you to relive the glorious excess of the era in which the Huxtables live. I'll be here, humming "Untuck My Shirt" to myself and poring over an online thesaurus to come up with new ways to say the same thing week after week so as not to lose readers. Don't leave me. See you at episode 18. Today's story starts off being about responsibility: Denise wants to buy tickets to a concert, but doing so will require her to sleep on the street overnight. 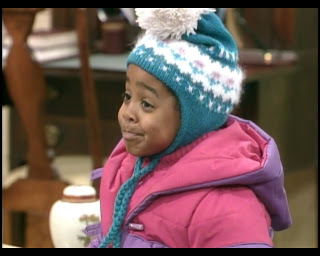 If she goes out with her friends, then Theo will have to step up to the plate and babysit Rudy. 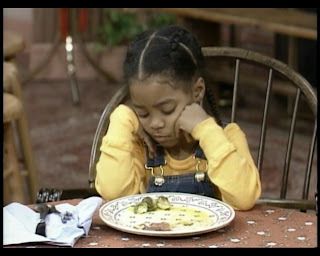 Rudy needs to be a big girl and eat her vegetables. Vanessa is responsible for briefly bothering the rest of the family and then retreating up the stairs to remain unseen for the rest of the night. Thanks, child labor laws! (Sorry, Tempestt Bledsoe. If it makes you feel better, I enjoy you more in later seasons. I never warm up to Sondra.) Anyway, any semblance of a plot disappears toward the end when Denise's friends arrive at the house at the same time as the couple with whom Cliff and Clair are supposed to go dancing. There's some generic "young kids dance funny" humor that makes Bill Cosby seem like a fossil, and then the older folks get in on the fun with some classier ballroom action. A good time is had by all, and Dancing with the Stars is unintentionally invented. Observe the teenage male in his natural habitat. We'll hit Theo up first because he only wears one look and it's mad boring. It's tough to say for certain, but I'm thinking the costume department only bought him one pair of jeans, maybe two. I've complimented their fit and shade before: you're not going to go wrong with a dark, slim denim. If he's only allowed one jean, he should be thankful that it's this one. The green long-sleeved tee is unremarkable to me. I don't mind the color, the fit seems reasonable, it's a good, generic top. He's added a little interest to the gray hoodie by cutting the arms off. It has kind of a Flashdance-for-doodz vibe. Personally, I abhor white athletic socks for any purpose other than actual athletics, but he's a teenage boy, so I can't expect him to go the extra mile there. 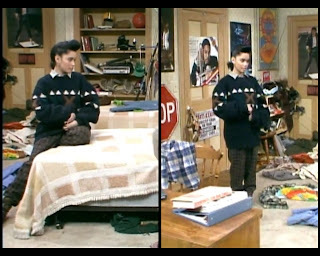 As for the sneakers, I'm fine with them aesthetically but forever curious about why the Huxtables all wear shoes in the house. You walked the streets of Brooklyn in those! Unclean. Look at me. Now look at your jazz record. Now back to me. Cliff starts out the episode not yet ready for the dancing extravaganza, but quickly gets himself in gear. Rather than give him a full costume change, the wardrobe department puts him in dress slacks and a white t-shirt, then upgrades the upper half when the evening hits. It's an economical decision, but one that doesn't make a ton of sense. If it's not time to go out, then you shouldn't be bumming around in your good pants. They're going to get creased and maybe dirty. Leave them hanging in the closet until later. Once he's fully suited, however, I'm impressed. Staying with a simple yet snappy palette, he pulls together the navy and pink smartly by using lots of patterns and contrast. The stripes on his tie, for instance, are actually lines within lines — meta-stripes, if you will — giving the impression of a wider range of colors than actually exists. The diagonal on the tie contrasts with the vertical pink and white pairing on the body of his shirt, but the ensemble remains coherent because the shades match so impeccably. The solid white collar pops out well, bringing focus and brightness to his face and adding a little more interest overall. I can get behind this. from wearing more than three pounds of excess bangle. Vanessa looks gravely worried, and rightly so: this isn't going to go well for her. To begin, she's in a sweatsuit, which is the sartorial means of communicating defeat. While I can't pretend I'm not slightly amused by her decision to wear a turtleneck under her top, I can't really justify the choice, either. She must be sweating bullets under all that warm clothing, and I'm not sure that mauve is the best way to offset the deafening volume of electric blue on display. Her other attempt to break up the monotony fares even worse. Charms dangling from the front of your shirt? Like you're a Christmas tree? Honestly? The concept is so unthinkably terrible that I am forced to wonder if I'm witnessing secret genius. Like, it's so impossible to defend that I have to question whether I'm wrong and she's right, and I'm just not seeing it. Let's get away from this before it damages us psychologically. 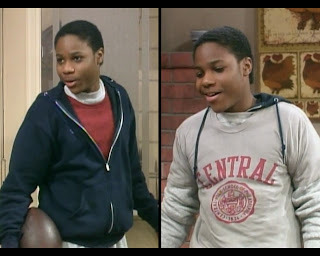 I never talk about Rudy on here, so I thought I'd take a moment to point out that this braid configuration is terrific. I like the hot crossed buns action on top. Also: aren't overalls great? Doesn't she look swell in yellow? There, Rudy, you got a short paragraph all to yourself. Feel the love. That on the left is known as the Awkwardest Shrug Ever. Denise wore this shirt/pant combo all the way back in episode two, and the cardigan in episode seven. Discovering that I knew this led to a dark realization. The longer this project continues, the more clothing I will be required to memorize, until eventually I have an unnervingly encyclopedic knowledge of the entire show's wardrobe. 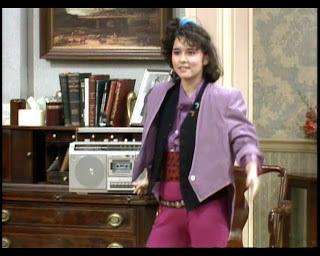 I will lose other information to make room for puffy blouses and pleated pants. One day, they will become all I talk about. People will distance themselves from me, recognizing how unhealthy my obsession has become. Soon, this blog will be my only friend. 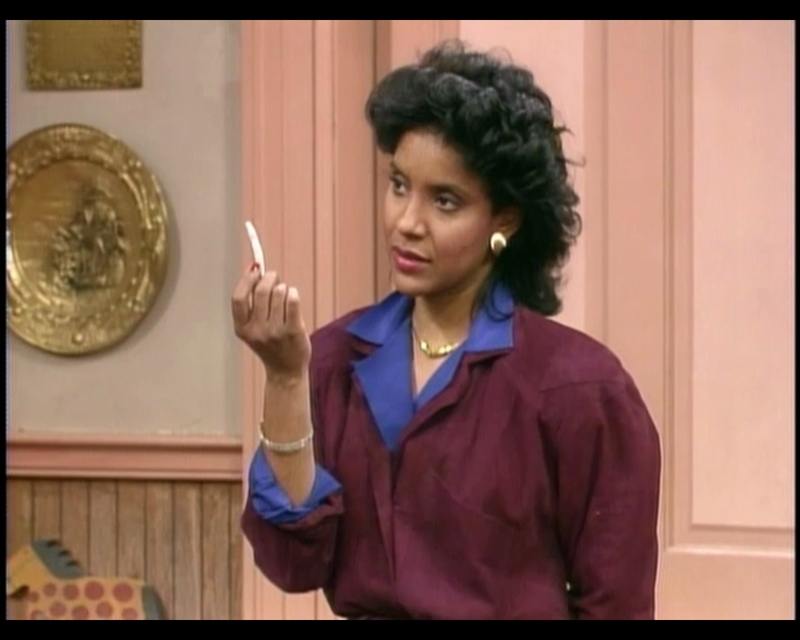 I will be like a crazy cat lady, only instead of felines, I will be surrounded my screencaps of Phylicia Rashad. These are the depths to which I am willing to sink for my readers. Also, she changed her hair and I'm kind of into it. I can't even snark in the caption. It's that good. When she gets ready to go out for the night, she nails it to the friggin' wall. I am deeply in love with this look. The red skirt suit is fun and funky: the color is ballsy, the shiny accents are fun yet still formal, and the long skirt keeps it squarely in evening territory despite the playful nature of the overall styling. She gives a nod to the roaring 20s with the fantastically long string of pearls, but then brings it into the excessive 80s by wearing basically all the jewelry she owns. We've seen her do brooches and cuffs in pearl before, but this is their best application yet, adding to an overall opulent look. Most people would warn against combining pink and red, and I'd often agree with them, but here it just comes off as confident and unexpected. And again, the satiny patterning of the underlying blouse makes it seem somehow adult even when it's surrounded by an almost comical array of strange fashion moments. Like most days, Denise is skating on the thinnest of ice, but she's on the edge of glory in this case, and I am all about it. Look out, Jennifer Aniston! She's after your husb... oh, never mind. My bad. I'm sure she's just saving her energy for an absolutely incredible dancing dress. 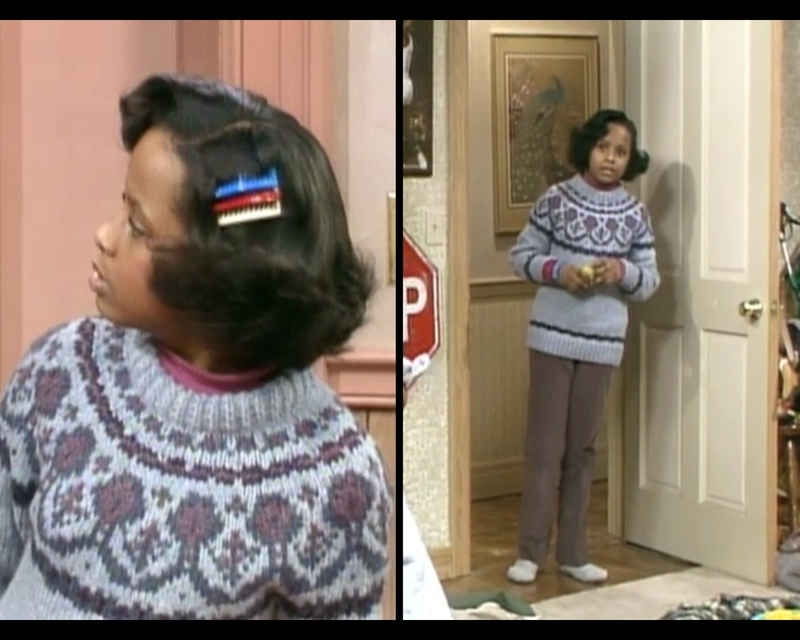 In an adorable costuming moment, Clair starts the episode wearing Cliff's sweater (first shown in episode three). I'm not sure she wears it better than he does. In fact, I know she doesn't. But I like that we see this happen. It subtly shows their closeness as a couple. The rest of her outfit is nothing special: solid black pants, solid salmony top. There's not much to say except that I love Phylicia Rashad endlessly and she'd have to do something exceptionally wrong to get me to speak ill of her. Do you really want to hurt me, Clair? 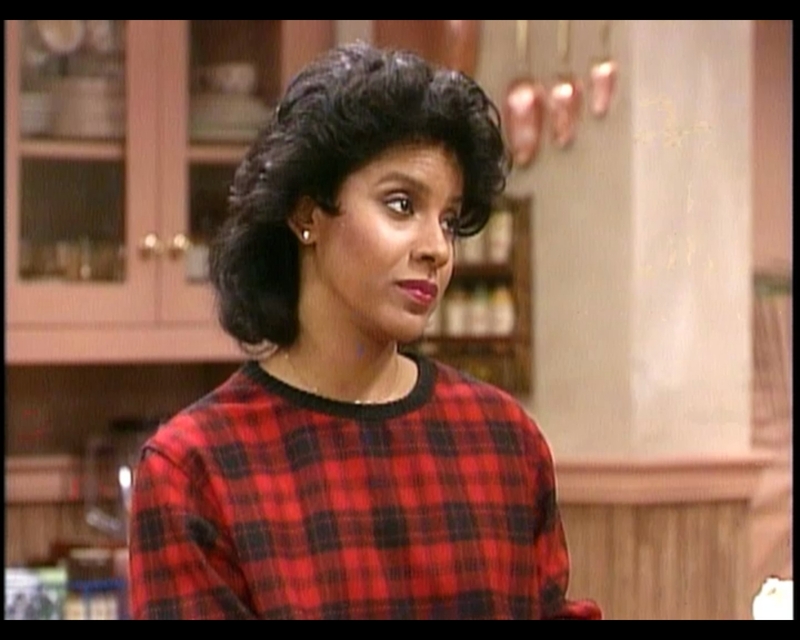 Oh, so now you're testing me, huh, Phylicia? No, ma'am. This I will not stand for. Need I remind you that your husband is in a suit? 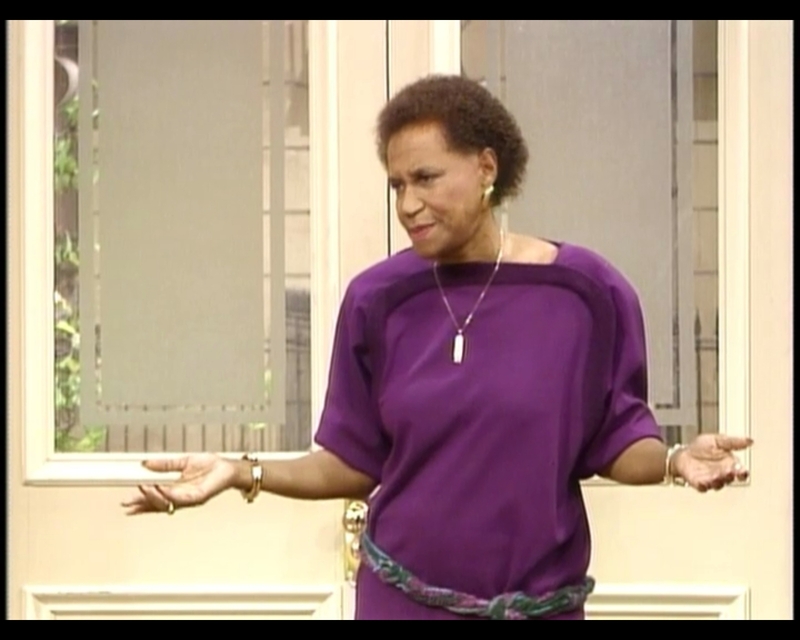 You look like the love child of Patti LaBelle and Charlie Brown. While I like her in yellow, this is all wrong. The oversized tailoring and crazy pattern on her top make it clear that it was designed for a much younger woman; while she looks exceptional for her age (especially considering the age she's intended to be on the show), it's still a borderline choice for her to wear a blouse aimed at the teenage market. Besides, judging by her dance partner's duds, she's going someplace fancy enough that this will be perceived as downright tacky. Poor judgment, Clair. Make a statement some other time. Tonight, go with something classy. You're going to make clowns of yourself and your husband. This episode also featured a handful of guest stars. I can't give an in-depth recap of the whole group of Denise's friends, but I'll explore the highlights for you. If you think these still are awkward, you should see these poor souls in motion. The girl furthest to the right does nothing for me. I hate the patterned shirt, I hate the yellow vest, I hate that almost everyone is wearing black pants. Avert your eyes. The guy next to her is faring a little better. That big cardigan is great, I like the pink shirt with the red tie, and the saddle shoes add some schoolboy realness to the mix. But with all that brown attire, why would you wear black slacks? Brown pants were invented before this, right? The main dancer, the dude in the blue, is trying really hard. For a breakdancer of his era, he looks the part, but by today's standards, he is a joke. Everything is wrong, from the harem pants that suddenly taper just below the knee to the spangly belt to the oversized blue shirt (with another terrible shirt beneath it)... I'd hand him a Worst Dressed award, but we haven't even gotten to Tuxedo McScrunchie yet. If pirates hijacked the Good Ship Lollipop. This is like a scene out of a horror movie for me. I need to get in touch with the producers of this show and verify that each of these items was taken to a separate location and individually burned to a pile of unrecognizable ash. Why? WHY? Fuchsia, red, and lavender mixed together? That's not a fashion statement, that's the recipe for gay cyanide. I'm surprised I haven't taken ill just typing this paragraph. She looks like the bartender at a circuit party thrown by a preschool. Nothing makes sense. Chaos reigns. 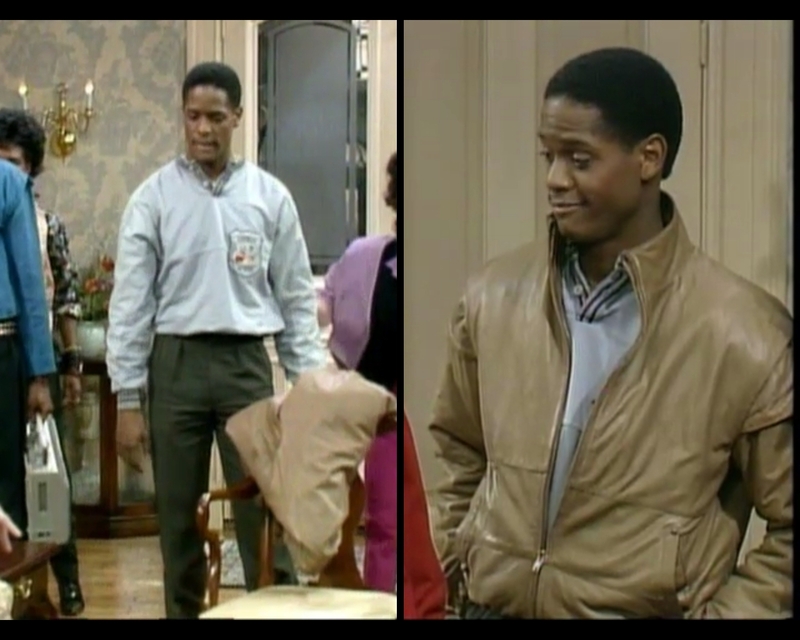 Hey, did you know that Denise is friends with Blair Underwood? He was dreamy even back then. Unfortunately, he didn't know how to buy shirts that fit. Look how puffy! Also, the horizontal crease across the middle leads me to believe that it was folded for a long time. That line is the telltale sign that this garment was put on immediately after it was purchased. Pro tip: wash your clothes after you buy them so that this doesn't happen to you. Also, buy clothes in your size. The green pants are nice (ignoring the pleats, as we must), and I like that camel-colored leather on him. It's not all bad. Also, being handsome helps any look immensely. Knock knock. Living legends calling. Now, here's where the real star power comes in. One of the great things about this show is that Bill Cosby was interested in promoting the arts and culture, with a particular focus on work generated within the African American community. These two people, though not immediately recognizable to most, are titans in the dance world. Donald McKayle is a noted choreographer who, in addition to his five Tony nominations, is one of the first black men to break into modern dance choreography successfully. Judith Jamison was, until early this year, the artistic director of the Alvin Ailey American Dance Theater; she is held in significant esteem as a dancer and choreographer. But all I care about is their outfits. Well, that concludes this week's entry. Celebrities, dance-offs, and fashion risks a-go-go. 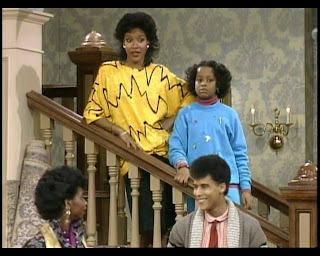 This is why I love the Huxtables with all my heart. Stay tuned, lovelies. Dr. Huxtable's prowess as an obstetrician has earned him a Physician of the Year award from his hospital. In addition to a plaque commemorating his accomplishment, he is given a banquet in his honor. This provides an opportunity for the family to get all dressed up. Almost everyone spends the first half of the episode in a bathrobe, but the eventual reveal of their ensembles is overall worth the wait. Apologies for the variable image quality: it was difficult to get good captures at times. I did my best, but even when each person was given a dedicated entrance down the stairs, it seemed like the camera was unwilling to linger on their clothes too long. Why will no one think of my needs? Sweatshirts make him SO HAPPY! 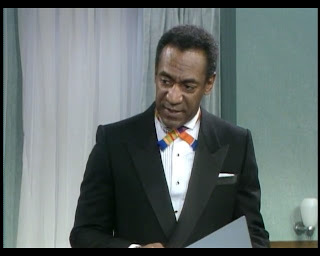 Despite being the guest of honor, Cliff is the only person in the house who didn't feel the need to shower before the formal dinner. I'm not faulting him for that choice, merely making an observation. I guess the other option is that he showered before everyone else, then decided to put this on before donning his suit, but I'm not sure if that makes any sense whatsoever. Regardless, he wears this, and it's my job to talk about it. I'm a fan of these sandy-colored pants; they're brighter than your average khakis, giving an update to a classic look. Also, they're flat-front slacks, which I've mentioned before are infinitely preferable to those with pleats. Up above, I'm not sure about the sweatshirt. I know he's just bumming around at home, so he really shouldn't be held accountable; he knows he needs to change before going out in public. Nonetheless, it's a mystery why this specific shirt was ever purchased. Not that it's horrible. He looks nice in red, and I'm sure it's quite comfortable. But the stripes are misplaced; either they're too far apart or too thin... something needs to change to make this OK, because right now it's not happening for me. Like I said, though, he recognizes the need to improve. Yes, he's in the hospital. These are his dress scrubs. A tuxedo is classic enough that it's difficult to critique. There are some key details to point out, but overall the main way he could go wrong was by not wearing one. Everything else is just nitpicking, but nitpick I shall. The biggest question for me is that tie. I've done a lot of Googling trying to figure out what that might be called. I can't imagine that such a neckpiece was literally invented for this show, but I also can't find written or visual reference for such an accessory anywhere else on the internet. It appears to be a thin strip of kente cloth, which is a patterned silk or cotton that originated in Ghana. Choosing to wear it not only adds brightness to his otherwise plain attire, but also celebrates his heritage to both the fictional audience at the banquet and the real audience watching at home. Since there's such an established history of how exactly a bow tie should be worn, I give him real credit for rocking a different style pulled from a different cultural history. However, given the lusciousness of those golds and blues around his neck, I wouldn't have minded a matching splash of something in his pocket square. At first I thought those were notecards for his speech in his breast pocket, but it's later revealed that Clair has those in her purse. The fact that I made that mistake means that something is amiss. An extra hint of yellow over there wouldn't have killed him. Lastly, it looks like there's a bit of a weird puff happening at the shoulder seam, like the jacket maybe wasn't sewn properly. Quality construction on a high-end garment like this is key. Those subtle flaws stand out. I think his eyes are actually going in different directions here. 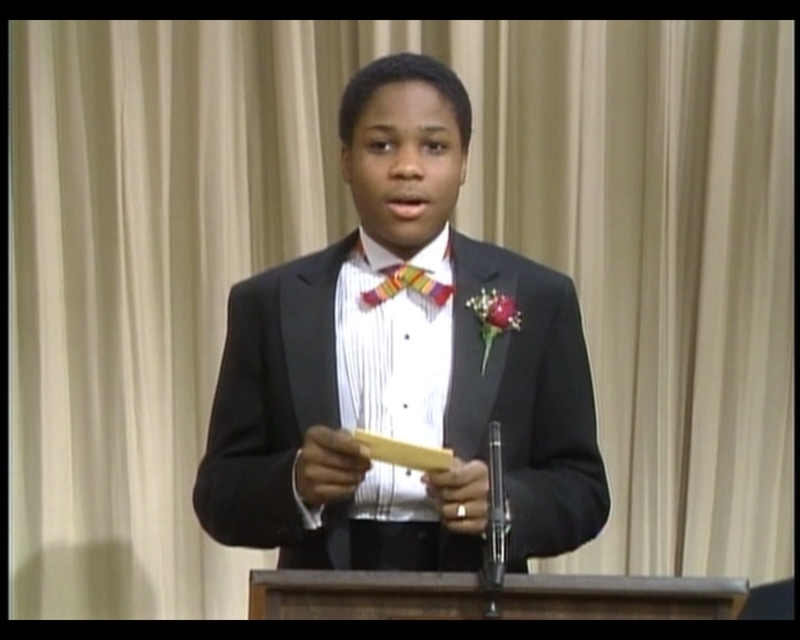 Theo is wearing essentially the same tuxedo as his father, including a similar kente tie. Check his shoulder, though: none of that bunching we saw earlier. 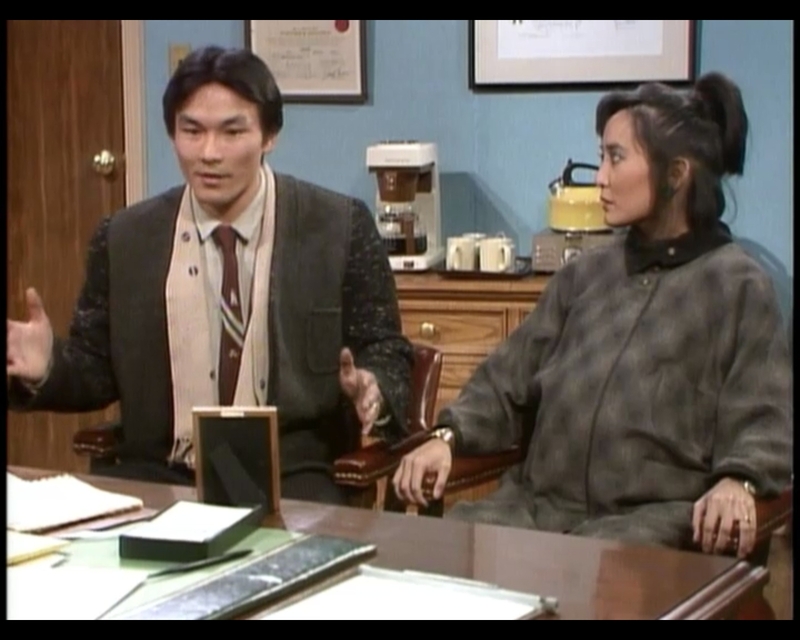 I'll also point out that both jackets went for the peaked lapel. I'm personally more partial to a shawl collar on formal coats, but I know that the peak is accepted as standard. Again, 90 percent of any black-tie event is, "Is he wearing a tuxedo?" He is. If Prince designed an American Girls doll. Everything about this look is way too old for Vanessa. I don't mean she seems womanly; I mean she seems elderly. The rich purple looks nice on her, but there's so much of it. With the dark color and the heavy fabric and the gathered skirt, it just seems so weighty. Imagine if she hadn't rolled up the sleeves! Then that doily around her neck just puts the last nail in the coffin. On the bright side, the hair ribbon with matching lace overlay is a nice touch that goes well with the dress while restoring a hint of youth. Overall, though, there are better ways to prepare a preteen for a formal outing. 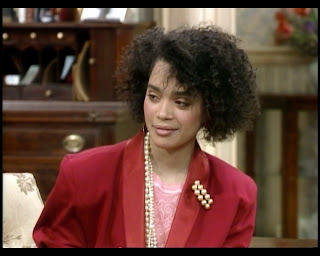 This might be the best Denise's hair has ever looked. Despite saying that I wouldn't review pajamas or other nightwear, I have to call out Denise's choice here. Even when not wearing actual clothes, she feels the need to assert her individuality. Check the tie on her robe: it's an actual necktie. Bear in mind that her family members are probably the only people who will ever see her with this on: she's really got something to prove. Ah, teenage rebellion. This episode aired before Pretty in Pink began filming. Just sayin'. 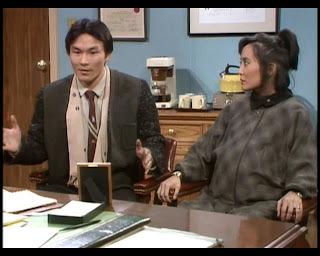 It's never explicitly stated, but I'm going to assume that Denise sewed this herself, mostly because I don't want to believe that there's a rack off of which it could be bought. To start off positive, let's talk about her application of lace. She wears it better than Vanessa by using it more youthfully: the skirt that hits above the ankle and the fingerless gloves insert a little deviance into the outfit, even if those choices also make it a hair less formal. The string of pearls wrapped around her wrist has a similar impact. However, there's way too much pale pink here. She needs to break up that monochrome with something accessory-wise, or else she looks like a dessert. The sweatery bodice is an interesting concept because it allows her to play with texture. The wool is a wonderful contrast to the lace, but you can tell that it's a tough material to tailor flatteringly. Between the sleevelessness and the chunkiness of this getup, her torso looks plain malformed. I'm fine with the earrings, but I might have gone for pearls in the neckwear rather than a gold chain. Maybe a choker? It's also worth noting that the front of her hair looks like a bird's wing. It's either trash or art; I can't even tell with her anymore. This shot comes directly after Clair mentions that she hasn't even begun to get herself ready. We are once again asked to believe that she is a) nearing 50 years of age and b) unprepared for an evening out. LIES. Can't. Breathe. Having the gayest fanboy heart attack right now. Can I just say thank goodness for Clair Huxtable? Seriously, look at what's happening here. I'm not sure whether I can muster the words to do it justice. This is unbelievable. A gold dress is the kind of thing you have to do just right or you look like a Vegas cocktail waitress. This woman knows just how to handle that fabric. The wrapping and draping add interest by letting the light and shadow insert depth to the garment's tone while positively exalting her figure. The arm band and black-and-silver shawl take her even higher, giving the slightest suggestion that she is perhaps a pharaoh or an Egyptian goddess. The nod to Africa helps her mesh with Cliff's look even when she's going in an entirely different direction from him. With such a stunner of a dress, she prudently scales back the rest of her choices: the make-up is minimal, and she opts for just-big-enough earrings with no necklace whatsoever. None is needed. The black hose, black shoes, and golden clutch all match without adding distractions. I'm in awe. How does she not wear this every single day? Where does one find that kind of willpower? I feel bad. I never mention Rudy anymore. She's showing telltale signs of neglect. My bad. She decided to match Vanessa. Gross. I should have stopped at Clair. 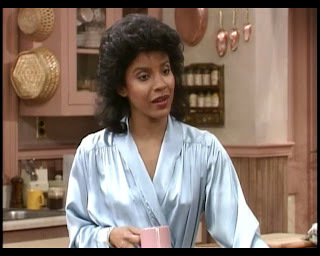 I shouldn't even be writing this blog right now, I should be writing a love letter to Phylicia Rashad. With a finish like that, we can assume that next week's entry will be a letdown. Please don't stop reading. I promise that there will always be something to talk about where this family's clothing is concerned. In some ways, it's almost more fun when it's bad. Until then. 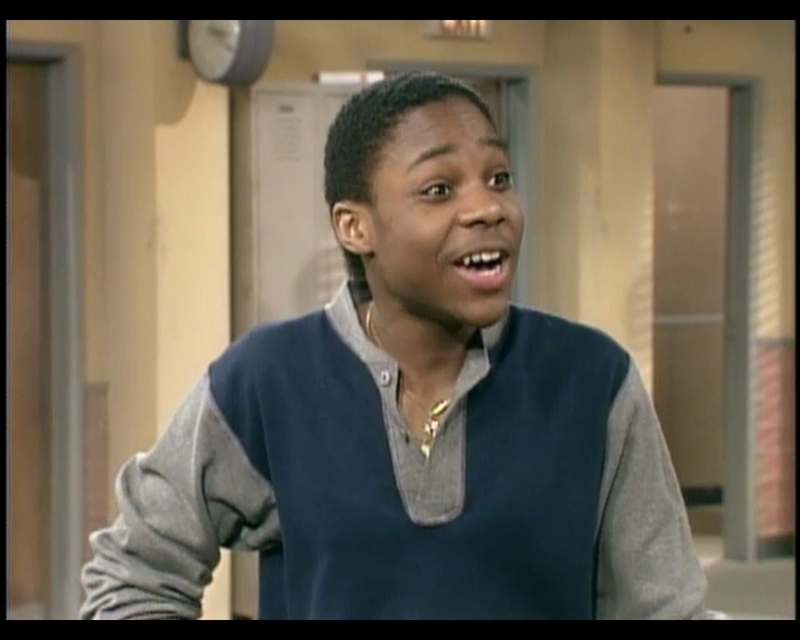 The family has its first encounter with that cornerstone of 80s fashion, the single earring, when Theo goes to Cockroach's house for the weekend and gets a gold ring through his left lobe. His attempt to hide the new accessory from his family is of course futile (was he really planning to keep it a secret until his 18th birthday?! 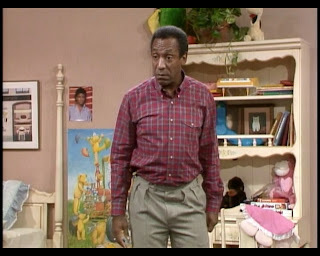 ), but Cliff's efforts to ridicule his son also fall flat when his own parents come over. 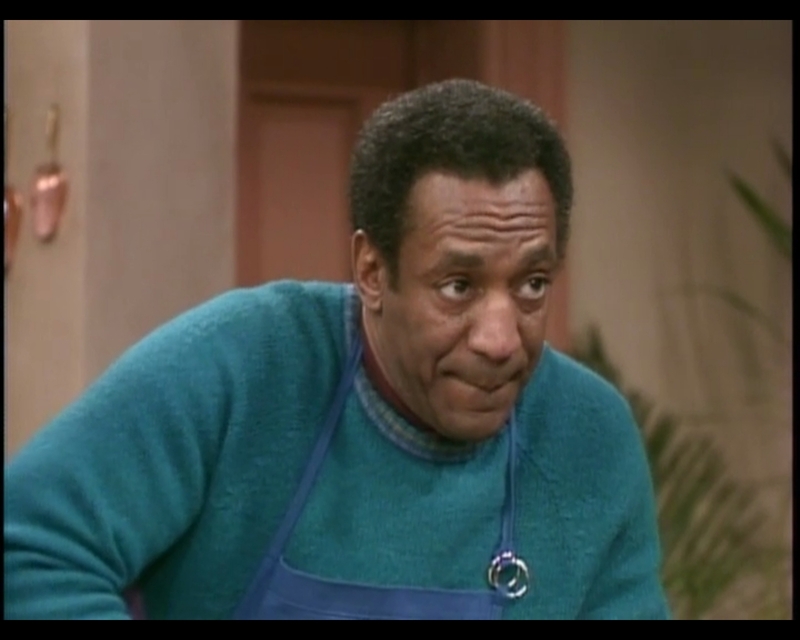 The discussion devolves into stories about the preposterous things the Huxtable men will do for a woman. We will continue that conversation by exploring the preposterous things they will wear for an audience. Since there are repeats this episode, let's get those out of the way first. Clair has brought back this red situation from episode 10. I didn't bother capturing it, but she's wearing the same black pants, too. It's not a look I'm going to grow fond of any time soon, so I'm hoping it doesn't get recycled too often. She's capable of so much more! Letdown. When we saw Vanessa rock this oxford and sweater vest in episode 8, she was a lot more creative with her other choices. While I miss those stellar plaid tights, I have to say that her top is better served by the neutral pants. This might not be a standout look, but at least all the pieces make sense together. Let's all put our grubby fingers in that fresh wound! We saw this shirt in episode 10, too. The scarf has been in the past two episodes. He's worn this coat before, I'm sure, but I don't think I ever specifically called it out. Anyway, this looks like a mad jumble to me. Theo usually seems much more coordinated. His weekend at Cockroach's must have been tough. Clair had the same problem when she came back from a night away in episode 11. 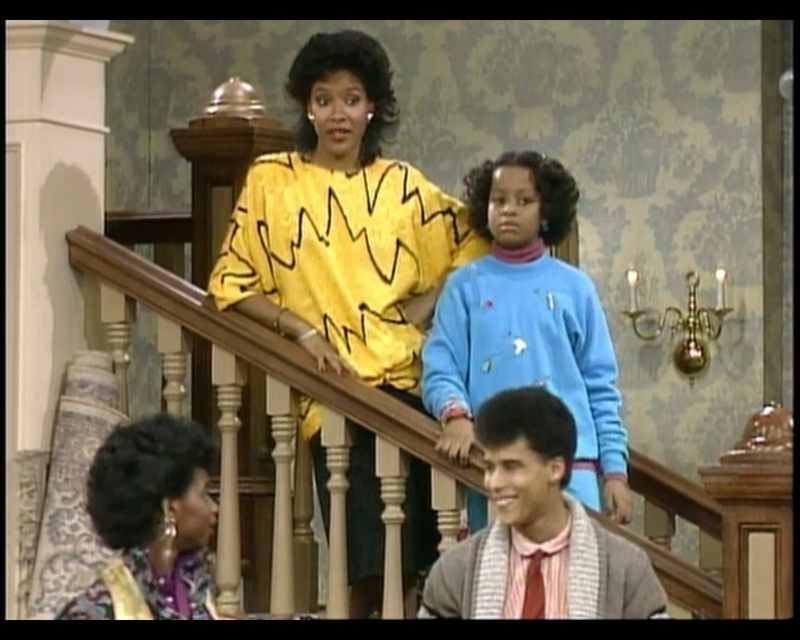 The issue seems to be that the Huxtables dress well, but pack poorly. Given that it's the subject of this episode, it would be questionable not to comment on the earring itself. The thing is, this particular piece of jewelry has a lot of symbolism and baggage both culturally and for me personally. Growing up during this era, I remember lots of talk about whether earrings were gay, and if straight men got their ears pierced. The consensus, at least among my older brother's friends, seemed to be that the side you chose for the piercing would also broadcast your sexual preference. The left side meant that you were straight; this was once reinforced to me with the helpful mnemonic device "left is right and right is wrong." You can imagine how reassuring this was to a closeted youth. Anyhow, I'm not a fan of the single earring, but I understand that it was hugely popular at the time and also that it's tough for me to be objective about it. I will say that the lopsided look has fallen completely out of vogue, and if today's fashion standards are the ostensible (if inconsistently applied) litmus test being used in this blog, then Theo fails this round. I'm shocked at the lack of facial contortions here. Was he sedated? It's strange that Cliff, who is remembered for his sweaters, spends so much of the first season in plaid shirts. The concept of incoherent woolen monstrosities was obviously stumbled upon later in the show's run. Little about what he's doing is remarkable in light of previous outfits. The shirt is alright. I like the blue on him, and the red/green stripes are confident without seeming overdone. On a dramatic level, I enjoy the printed tee as his bottom layer, because it lets the viewer know that he wasn't thinking too hard about his clothes today. As a critic, however, I'm distressed: you should never not be thinking about your clothes! My God, man, how do you not own a plain gray t-shirt? I'm also of two minds about the pants. Look closely at his hip, and you'll spy metal fasteners for adjusting the waist, like those found on rented tuxedo pants. I'm intrigued by this concept: I've only encountered those clasps at formal dances and weddings. I know that some dress trousers have them, but in my head, they're firmly associated with garments that need to be versatile because they will be worn by several people, none of whom own them outright. They're not a stylistic choice, they're a practical consideration. If your waistline expands or contracts, that's your business, but maybe wear a belt to hide the evidence. Denise is doing pretty much everything wrong. We'll start with the palette. I think I've said previously that basing an outfit in reds and greens screams Christmas to me. If you're not one of Santa's elves, you're not allowed to do this outside of late December. But even in different shades, this would be ugly. First, there's the confusingly tailored sweatshirt. The largeness around the shoulders makes sense (she's certainly done it before) until you check the sleeves, which get tight starting at the elbow. I'd almost rather the whole thing were huge: reminding us that the shirt could be form-fitting (as any top should be if you plan on layering with it) is just a tease. While we've got the close-up, let's also acknowledge that her bangs are mad tall. Their house must be really windy today. Anyhow, there's more to look at with this one. Can someone please explain that mask over on the right? Thanks. Forever exploring the outer reaches of the fashion universe, Denise has decided to give us her take on sports. The "dress" she's wearing is actually a grotesquely oversized basketball tank top, complete with a number on the front and some black stripes on the bottom. I don't know what to say. The number of times she's given us Halloween-worthy ensembles leads me to wonder if it's all just an epic prank or some obscure trend I never heard of or... just what the hell is going on? Why? I need to know why. All I can say is that this is a bad outfit. The belt hardly matters because there's no accessory on Earth that could save it. Everyone's letting me down today. You know we're in trouble when Vanessa looks like a solid contender for "best dressed." Class, I'd like you all to say hello to the new girl. 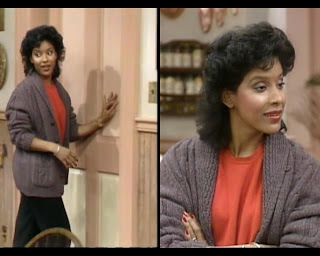 Here we have Clarice Taylor in her first appearance as Cliff's mother, Anna. She comes off a little grumpy in her initial delivery, but the character quickly warms up. This dress, on the other hand, never improves. The amethyst is a nice hue for her, but nothing else is helping. The contrasting bar at the neckline is the only thing adding even a hint of shape, and she doesn't need it up there because her shoulders are broad and lovely. The sleeves and torso are just formless, though: between the cut and the material, she's essentially thrown into a purple sack created to exacerbate gravity's effects on her upper arms and bosom. 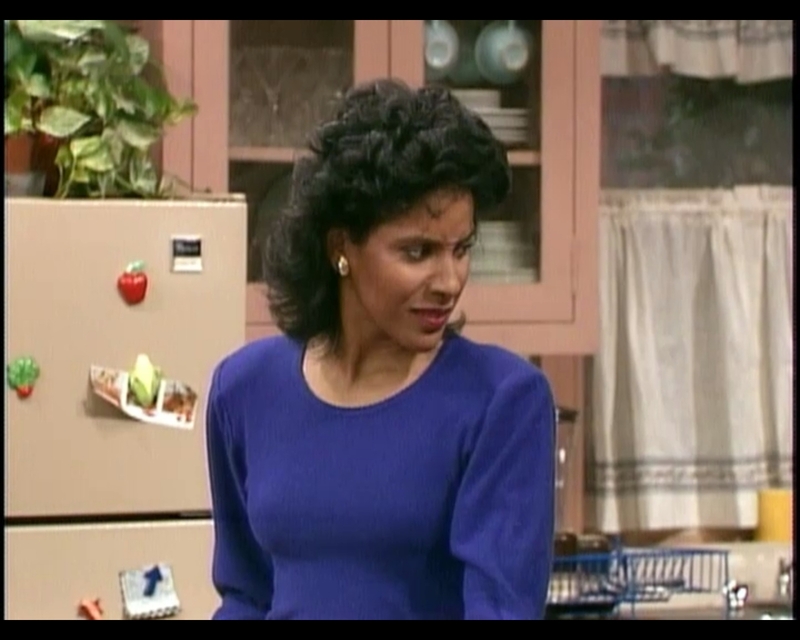 It was hard to get a good screen cap, but below the waist, she's dressed a tad too young; her high black boots are more appropriate for Denise than Denise's grandmother. I'd say that the belt could be a little higher, but really I want it replaced entirely because it appears to have been made at home from old bath mats or something. What a clumpy, faded, damp-looking string of grossness! I wouldn't want to touch it, let alone wear it. I also want to trim her hair. She'd look great with a tighter, rounder style; that extra squared-off chunk in the back is especially distracting. Picture it all one length, and slightly shorter overall. She could pull it off. Being this casual while looking this good is Zen mastery. Oh, Russell Huxtable. You prince. You lifesaver, you. My faith in televised fashion is restored. Just try to tell me that this isn't magnificent. I won't hear it. 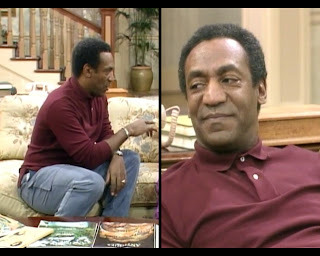 Back in episode 8, Cliff attempted to rock a similar sweater, but he blew it. His father makes it work perfectly. I can hardly choose what to compliment first! The whole look is constructed with such care. The soft taupe of the trouser is simple enough not to distract, but not as boring as a standard black or khaki. The brick-red patterned blazer is more assertive without becoming challenging. Look carefully at his shirt in the tight shot: that's not white, but pale pink with white stripes. Again, neutral without being bland. He's not going to settle for plainness. The tie is like the jacket: its richly shaded stripes still avoid veering into brashness, and it skillfully matches with the other garments in terms of hue. Then, just when all those members of the red family are getting comfortable, he turns that color wheel nearly 180 degrees and gives us full-frontal teal. It's so daring, but so right. Look at him. That's how it's done, kids. Closing on a high note is always nice. I never know what to say to end an entry, so at least the fashion continues to sizzle even when the prose fizzles. (Yeah, you're right, a rhyme probably wasn't the way to go.) See you next time, all. I'm afraid I have some bad news for you all. First, as you may have gleaned from the title: Rudy's sick. Poor Rudy! 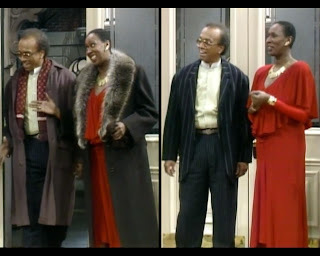 Second, this is another episode in which few outfits are featured. Poor audience! I know, it's hard, but we'll get through it together. I'll try to make my commentary extra insightful and hilarious. Quality, not quantity, people. As before, let's start off with the day players. 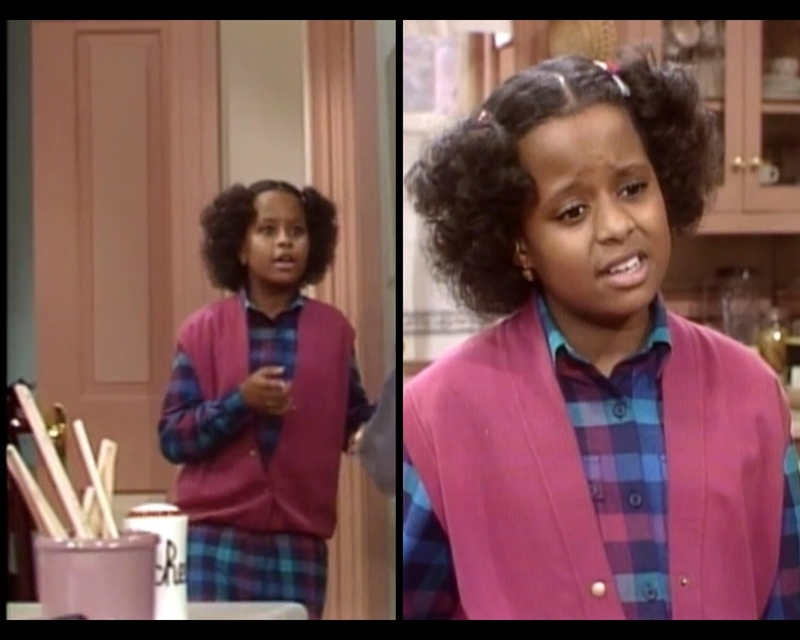 The anticipation will make the arrival of actual Huxtables seem so much sweeter. 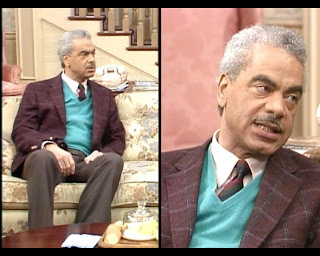 This is Clarke Gordon as Mr. Halifax, the founding partner at Clair's law firm. He had already been working in film and television for over 30 years at this point, with character roles here and there in everything from Gunsmoke to Lassie to Charlie's Angels. His character is dressed in the standard Rich Old White Man uniform, the pin-striped three-piece suit. There's not much to find fault with, really; it's a look that has stood the test of time for a reason. Other than the fact that his shirt cuff could be a tad crisper, he's impeccably sharp. I find it particularly hilarious that he has the shaggy hair and trimmed mustache of a modern-day twenty-something Brooklynite. 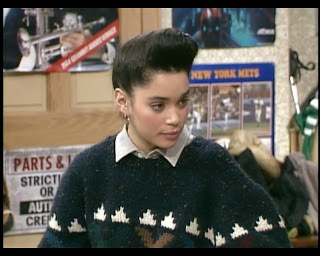 Seriously, get off the L at Lorimer and do a quick 360 scan; I promise you'll spot this exact hair configuration. (That dude isn't dressed for the office, though; he's wearing skinny jeans cut off at the knee and a really baggy tank top. No, go look. He is.) Anyhow, boss man looks like a boss. You can't argue with the classics. I will take a second to point out his bow tie, mostly because he calls it out himself. After informing Clair that it is a "quality" piece, he begins to extol the virtues of quality, going as far as to say that the tie will never go out of style. 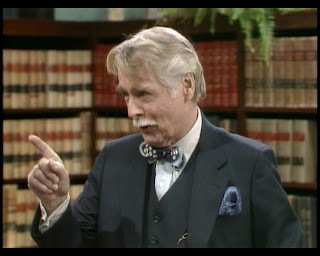 While I'll get behind the overall concept that fine materials and well-made garments remain staples in any era (e.g., the proverbial little black dress or aforementioned three-piece suit), I wouldn't go as far as to call this tie a timeless classic. The pattern is evocative of sequins, which don't really belong anywhere near this ensemble, and the colors clash with the pocket square. Sorry, guy. Not all silk bow ties are created equal. I love that Cliff faces the pictures on his desk toward the patients, not himself. Meet the Yamados! Janet, played by Haru Aki, is wearing a particularly terrible maternity dress. I get that it's cold out, but just wear a sweater or something. This cut is edging into sister-wife territory. Steve, also known as Doug Yusuda, isn't doing much better. I'm not saying that it's wrong to vary fabrics and colors between the body and sleeves of a coat, but I will say that it's wrong in this case. Since the colors aren't that different, the darker, mottled arms just look filthy as a result, like they need to be rinsed, dried, and vacuumed repeatedly. The collar on his shirt is a little small, and the tie's a little thin. Truthfully, I think that combo would look fine today if the tie were solid instead of weirdly striped-ish; it's largely personal preference that makes me question it. I know people who would wear similar items. The scarf is objectively problematic, however: it's too close of a chromatic match to his shirt and the coffee beans on it are weird. I hope the baby's cute at least. "See these pleats? No? Lemme squat into them for you." I'm not positive, but I think this shirt is different than the one Cliff wore in episode 3. The blues in that one were much more vibrant. Maybe it lost its color in the wash. 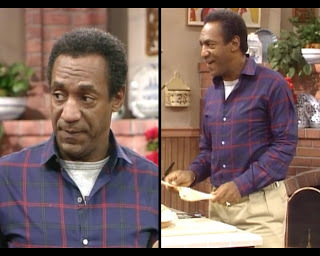 If it's not the exact garment, it's still the same basic concept; he seems about as comfortable in a brick-colored plaid as Clair does in a solid eggplant blouse. This is an unremarkable showing from Dr. Huxtable, but he's just bumming around the house, so I can't hold him to too high a standard. It's a generic, perfectly acceptable Dad outfit. Yawn and move on. Vanessa already did this to us in episode 8, only last time she didn't button the sweater. When I went back to review my previous commentary, my first thought was, "Why did I not mention that she looks ridiculous with the collar closed? 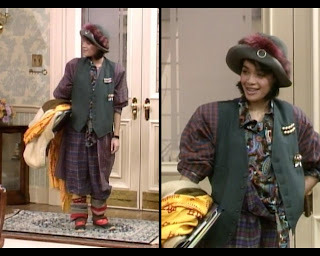 She's like an Amish child in technicolor!" Thankfully, she retroactively heard my unspoken judgment. I'm really not sure what they're aiming for with this hairdo, though. It keeps getting bushier on the sides and flatter on the top, and I just can't imagine why anyone would value overall cranial width as a beauty marker. "Look at how much lateral space my head occupies!" I'm at a loss. Remember when we used to talk about how stylish you are? 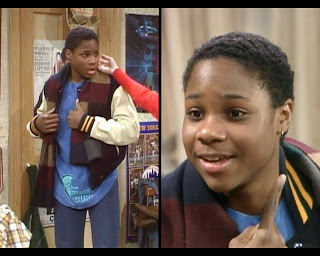 Theo wore this same jacket and scarf last time, and I opted not to mention them. Today, he's only wearing jeans and a sports jersey, so I've got nothing left to talk about except his outer layers. It's like an installment in the Final Destination series, except instead of death, I'm being chased by color blocking. The coat is actually a great example of how you can contrast the arms from the body in a fun, fashionable manner, so take notes, Mr. Yamado. The forest green goes well with the midnight blue; it's manly but still has a stylish flair to it. The scarf would be perfect if that emerald chunk by his neck weren't so close to (yet so far from) the shade of his sleeve. It's a shame that he's not trying harder with those foundational garments. Well-matched outerwear can partially mask your outfit's schlubbiness, but not entirely obscure it. This is a really interesting case, because Denise is dressed for a "slop rally" at school. Unfortunately, since the costume department has already thrown so many cartoonish looks her way (episode 7's Hogwarts uniform immediately jumps to mind), they had to go way overboard to prove that this is something she wouldn't otherwise wear. Even with the volume turned up this high, I was half-convinced that she was just wearing this because she's into looking weird. I will say that as an outfit specifically designed to look trashy, it's actually holding up well. For this many layers to look even mildly acceptable next to each other, someone must have been planning for hours. 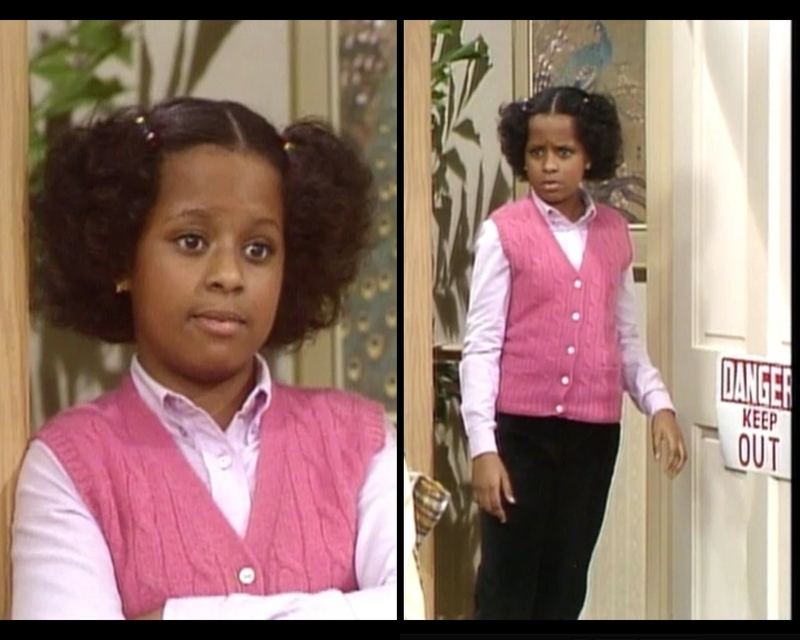 The paisley blouse is so wild that it should basically cause a nuclear reaction when exposed to that plaid dress, but the soothing neutral of the vest cuts the tension. Her khaki coat is plain enough to pair nicely with everything below it, and all the muted colors are brought to life by the vibrant scarf. The bulky legwarmers are a little ridiculous, but really everything about this ensemble is a little ridiculous, so it fits. Ditto on the hat: gray bowler-looking thing with a fuchsia fur flourish? Why not. And brooches everywhere because apparently she's been collecting two a day since birth. Somehow everything ends up fitting together like a complicated puzzle. 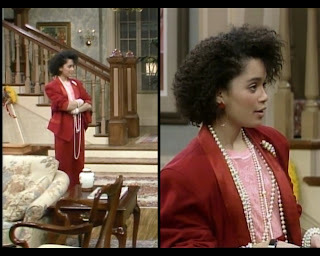 Against all odds, this examination has made me want this to be an actual look. I a little bit love it. Last but never least: Clair. As we've established previously, things like bathrobes and nightgowns aren't going to be explored in this blog. On the other hand, I couldn't help but capture this moment because I can't believe that we are expected to buy this as an early morning face and hairdo. Does anyone drink an 8:00am cup of coffee like this? Look at the height she's getting from this coiffure. It's so majestically large. Seriously, imagine that below the waist is a gray pencil skirt. She's ready for work, right? She's interviewing to play Grimace at the McDonald's down the block. Today, however, is not just any work day. Today Clair is discussing the possibility of becoming a partner at the firm. She needs to dress to impress. 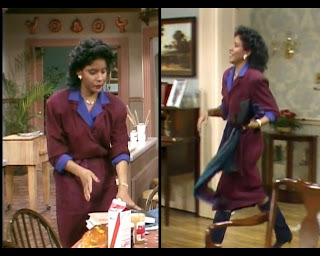 Given the circumstances, I'm surprised she didn't wear more purple, but she did fall back on the reliable Huxtable standby of cerulean and black. There are some things I like about what she's doing. This is somewhere between a coat and a dress, and as you can see from the above shots, it's a versatile piece. She plays with a few different button configurations, which are placed from left to right in order of how much I support them. The clear winner for me is to close the top and leave the bottom flowing, giving a sort of caped effect. The garment is cut pretty widely, and allowing it to billow sort of masks that. If it gets closed all the way, as on the right, then it looks pretty frumpy. I'm surprised she went for what appears to be a black leather necklace over her turtleneck. For an interview of this caliber, I might have worn something with more universal appeal. In fact, overall, I question her instinct to go for non-standard, fashion-y pieces. He's wearing an old-school suit; she might have been better off in something more classic. And there we have it: the end of the road. It came too soon, didn't it? Let's meet back here in a week and talk about outfits some more. I love these little chats of ours.